The mega cricket event organised by the Trade Association of Information Technology (TAIT) was a unique initiative that saw OEM’s and IT retailers (Channels) come together to play for as a team. The event was held at the Bhakti Park Garden, Anik Wadala Link Road, Bhakti Park, Wadala East, and Mumbai. 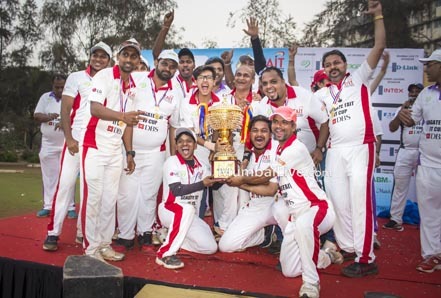 The LG-Orno Gladiators, a team owned by LG in association with its distributor Orno Computers, displayed an all-rounder team performance as they played with 11 other teams for two days to win the coveted grand final and claim the SEAGATE-TAIT IT CUP 2018 title. The TAIT IT Cricket cup has been an annual event since 2014 and this year assumed a larger, reformed format, with active participation by the members. 2018 has seen the event expand to a larger, innovative format, spreading over two days and involving the OEM’s for the first time. Sphere-headed by the new director on board, Sunil Thariani, with the event committee members; directors namely Samir Parekh, Samir Mehta, Magan Gangani, Gopal Pansari. This initiative was well supported by the board. The event was meticulously planned and followed the popular IPL format of cricket. The 12 participating teams were formed with key OEM’s as owners and the distributors as co-owners, making them close partners and team members. The teams were divided in 4 groups and played 12 league matches, 4 quarter finals and 2 semi- finals. Also unique to this year’s TAIT IT Cup 2018 was the association with mumbailive.com who was the broadcast partner for the event and was instrumental in recording and broadcasting the tournament to reach over 37 countries, garnering more than 16,000 views over two days! Jwala Singh, a formal national level cricketer, current director of the Mumbai Cricket Club and coach of Prithvi Shaw – the illustrated Indian cricket captain of the under -19 team was the honorable chief guest at the tournament. The Man-of the series title was awarded to Aakash Aakhade of LG Orno Gladiators sponsored by Seagate and the winning team and runner team each member were facilitated with medals and the gift from Livetech. Title Sponsor- Seagate, Co-Sponsor DBS, KIT Sponsor- ACER, Boundary Sponsor- TSS Vision, Mumbai Live TV Sponsor- D-Link, Radio City Sponsor- Creative Peripherals, Tent Sponsors – Bluecom, Silver Sponsors – Zotac, Cheer leaders Sponsors – Intex. Gifting Sponsors- Seagate, Livetech, OM Shakti Computers, Kaspersky, Suresh Computers. The award ceremony concluded the proceedings of the two-day tournament and was marked by enthusiastic cheers appreciating the special performance by individual and team players. The organisers and the sponsor OEM’s too were in high spirits, as the event smoothly unfolded over the last two days and ended on a high note. The matches were played as per the rules and guidelines set aside and monitored actively by Rahul Jahveri and Dewang Thakore, dynamic TAIT members and entrepreneurs. The commentators, umpires and the scorers were highly experienced and proactive, giving the entire event a fair and professional flavor. All the matches saw enthusiastic participation, combined with lively commentary, great food and refreshments and an excited audience. The second day of the event was also graced by family members of the players and it all added up as a fun and exciting weekend, away from the routine stress of the jobs where the different players of the IT ecosystem bonded together purely as passionate players, making the visible comradery between them heart-warming! SEAGATE-TAIT IT Cup 2018: LG-Orno Gladiators Wins the trophy 0 out of 5 based on 0 ratings. 0 user reviews.